The greatest threat to the UN Climate Change negotiations in Paris, which start next week, comes not from incentives to free-ride on the commitment of others, but from the failure of most countries to recognise early economic opportunities that come from reducing greenhouse gas emissions. Excessive emphasis on ‘burden sharing’, the ‘right to emit’ and costs associated with the language of shared sacrifice reduces national incentives to secure ambitious action to limit climate change and take advantage of low-carbon finance and technologies. For global leaders seeking an international agreement, the focus instead should be on harnessing the potential benefits from action. Since the Kyoto Protocol, a key element of the international negotiations has been equity. This is used to determine the ‘fair’ allocation of costs and burdens between countries based on individual historical responsibilities, relative capabilities among countries and the impact of climate change. Although such concerns remain valid, much of this debate has proven divisive and often resulted in the search for a minimum acceptable level of individual action. To date, 156 countries have submitted their pledges on national actions to the UN (the so-called ‘intended nationally determined contributions’ or INDCs) to address climate change that they propose to deliver as part of the international agreement. These countries account for 92% of global emissions. The INDCs include plans for emissions reductions and related actions on finance, technology cooperation and capacity-building to support it. The key point that is often missed is that the main criteria for determining national mitigation pledges are domestic political agendas and the need to satisfy popular opinion, local institutional and industrial interests. This means that INDCs are likely to reflect national circumstances. These include i) the cost of action, taking into account natural endowments, such as reserves of fossil fuels, or the energy intensity of production (for example the presence of industry dependent on coal); (ii) anticipated local damages from climate change, and – crucially – (iii) the benefits that accrue from policies that aim to reduce emissions and attain other policy goals. 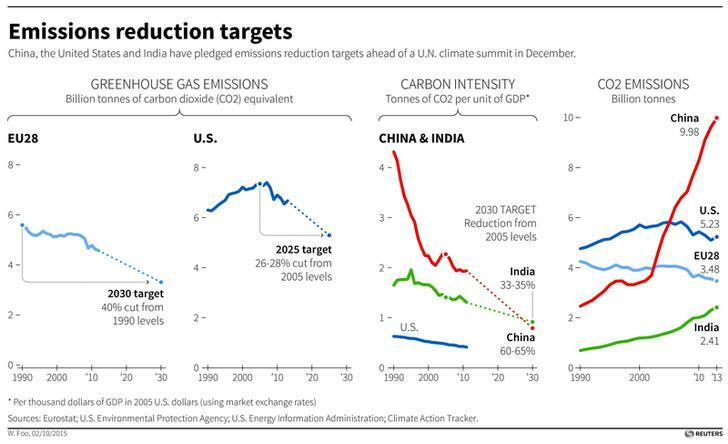 While the third reason has in the past been relegated in importance, there is growing recognition that there are significant social and economic returns from investment in emissions reduction for many developed and developing countries that are not captured in narrow cost assessments. A recent authoritative study found that more than half of emissions reductions required to meet an ambitious target generate co-benefits. These include health benefits from reductions in urban pollution, addressing traffic congestion, increases in efficiency or improvements in energy security and supply. For example, air pollution destroys millions of lives and livelihoods every year and cost between 5% and 15% of GDP for major emitters – as much as many of these countries spend on healthcare. Efforts to reduce emissions through renewable energy, clean transportation and energy efficiency stand to slash such impacts. For the remaining emission reductions that do not secure narrow benefits, the principles of ‘burden-sharing’ and responsibility have a role in determining their distribution. Recognising these opportunities – as some INDCs do – strengthens the case for climate action in most regions, but does not diminish the responsibility of rich countries to support such a transition through technology cooperation, financing and capacity-building. Indeed, investing in domestic opportunities with global implications in terms of reduced emissions requires coordinated support. The ultimate aim of international collaboration, in the form of finance, technology and sectoral partnerships, is the support of projects with high domestic returns and global climate benefits. If the availability of solid emissions reduction projects goes up as a result of the recognition of new opportunities, it increases the case for supporting the diffusion of technologies, capacity – and institution-building and access to cheap finance. To overcome domestic opposition and make for a credible international pledge, climate action must deliver local benefits in the direct self-interest of the country taking the action. We need to move away from the narrow principles of cost and ‘burden-sharing’ towards incorporating the principles of equitable access to sustainable development, including the benefits to growth from climate action. There is no shame in INDCs openly calling for finance and technology from other countries in order to deliver such benefits, if the end-result is global emissions reductions. Some already do this; others should be encouraged. Understanding and articulating domestic opportunities from ambitious decarbonisation is the key to making national policies credible and unlocking flows of public and private climate finance. Recognising the benefits of climate action as well as the opportunities to attract inward investment through collaborative partnerships can increase the level of ambition in managing climate change risks, while advancing development goals. By contrast, a focus on burden-sharing will lead to further delay, division and deadlock. We need a broader understanding of the near-term, local benefits of climate action to provide incentives for all countries to strive for an ambitious and comprehensive international agreement in Paris.